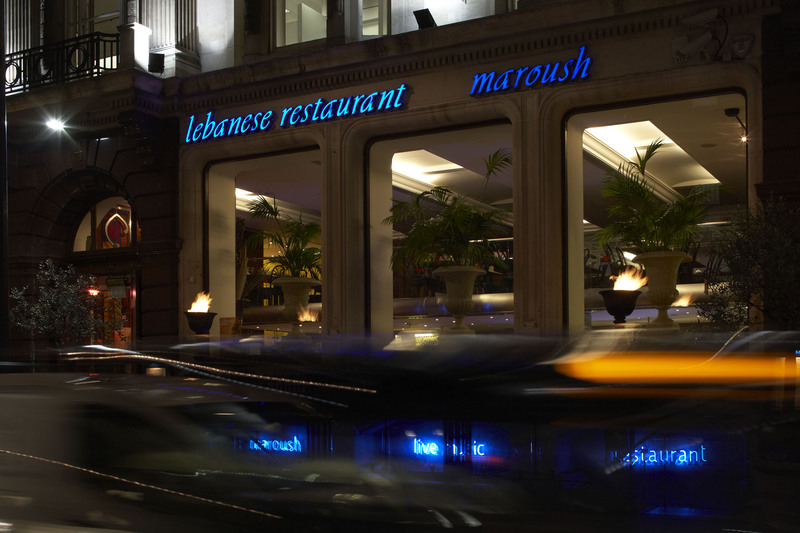 Discover some of London’s finest Lebanese cuisine, prepared, cooked and presented by people who love what they do. Whether you’re after a quick lunch, somewhere to impress a new client or the perfect spot for a celebration with live music, belly dancing and a crowd that know how to enjoy themselves, Maroush Vere Street is the place you’ve been looking for. Escape the bustling crowds of Oxford Street and interact with our outstanding chefs to enjoy a lunch catered to your personal taste, or take refuge on our mezzanine, a quieter, more intimate, space where the comforting, vibrant atmosphere drifts up from the floor below. Our menu boasts a wide variety of authentic Lebanese dishes ranging from wholesome cold starters such as Moutabal Baba Ghanouj, grilled aubergine purée mixed with sesame paste and lemon juice, to delicious mixed sharing platters for 4, accompanied by a thoughtfully selected bottle of Lebanese wine. 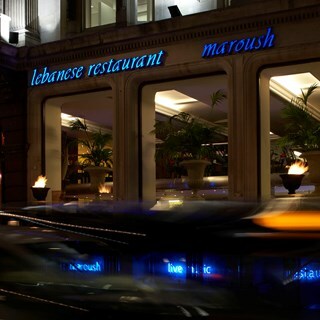 Wednesday through to Sunday, as the evening approaches, Maroush Vere Street opens up it’s lower ground floor to spectacular live entertainment. With lively Lebanese music and traditional belly dancing you will feel the heart and soul of the Lebanese culture shining through all night long. Phenomenal team, service and food! thank you! The set menu at lunch at a special price is a very good idea and only things is that perhaps the desert quantity can be increased. Amazing food made even better by the great service. Great value for money. Food and pricing was excellent. The only thing that is stopping me from giving the maximum rating is the timing at which they gave me my food. I have ordered both starters and two main courses which were both given at almost the same time (2 min difference or so). It has caused the food to not be as warm as it could have been. On the good side they were giving every customer a small plate of baklava (5 mini pieces) which was actually great. Another thing is an atmosphere. The furniture are rather outdated and low-cost ones and so they do not make the place look as nice as it could. It reminds me of a bar rather than a restaurant that is placed just next to the Oxford Street. Looking at the number of visitors coming they have funds to do it. I think they should consider changing it as it is not that pleasant. Overall my rating will be 7.5/10. Nevertheless it wasn't my first time there and I will definitely come back. Great lunch today. Service always friendly and relaxed, food amazing, you have to have the chicken wings! The lady who served us was so very lovely. Thank you. Always an excellent experience at Maroush which makes me feel like I am back home in Lebanon. Excellent service, from booking to the final bill. Thank you for looking after us - a work group from all over the world, who were all impressed by Maroush. Thank you. A big thank you to Anita and the other staff - this is the 2nd time I have specifically requested a dish when making a booking and on both occasions Anita ensured that our request was satisfied. On this occasion I made the request and booking with less than 24 hours notice but received quick and helpful responses. The food lived up to expectations and service was quick and attentive (especially welcomed on a busy Friday evening). We were not rushed to clear the table once we had finished either. Staff were all very attentive and the food was excellent and fresh. All the team really enjoyed their lunch with you. Most enjoyable. Good to know you are open all night. Highly recommended. Definitely be back! Fabulous experience, such great service by the nicest of people. On my first visit to Maroush I was pleasantly surprised. It was busy and the atmosphere was buzzing. Our waitress was friendly and professional and the food was plentiful, tasty and fresh. We will be back. Everything was good from atmosphere to food to service thank you maroush...if I want to change one thing it would be (avoiding the draft from the door) whenever it opens it gets a chilly, especially for people stitting near the entrance. I booked a table for my husbands birthday which the staff were aware of. Although the staff were very polite the service was more or less non existent. Then had the cheek of adding service to our bill. Will not be returning! We booked for a Xmas Company lunch. We ate a lot and everybody were very happy.The Staff is very kind and the food was what we were expected. We came here for a Christmas company meal and had such fun - the whole team could not have been more helpful. Very professional and great attention to detail - we will be coming back again next year! Thank you Anita and her team for a great evening.